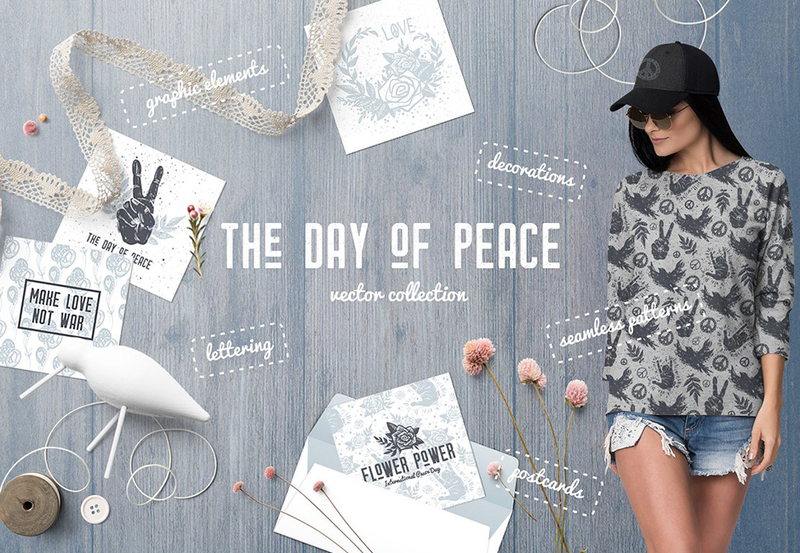 The Day of Peace is a big hand-drawn collection of peace vector elements – drawn with love birds, doves, hand gestures, peace symbols, roses, flowers, florals and other clipart elements & various lettering words. The Day of Peace is a great product for International Peace Day and other holidays greeting cards, apparel, t-shirts, mugs, bags, tags, home decor, branding, packaging and other occasions! Each peace vector element is saved as a separated PNG with transparent background (also you will find them in .AI and .EPS formats) – it’s easy to use in almost all graphic editors. Software compatibility: Adobe Illustrator CS3 or newer. .JPG and .PNG files will work with most graphic software. .EPS files will work with a variety of programs such as Adobe Photoshop or Illustrator, Sketch, InkScape, Affinity, Corel Draw, etc. Software compatibility:Adobe Illustrator CS3 or newer. .JPG and .PNG files will work with most graphic software. .EPS files will work with a variety of programs such as Adobe Photoshop or Illustrator, Sketch, InkScape, Affinity, Corel Draw, etc. File size is approx 104.2MB (193.2MB unzipped), offered as a single download.